Again, continuing the Co-management and flipping the switch journey, and moving the brand new Device Configuration workload to Intune MDM. 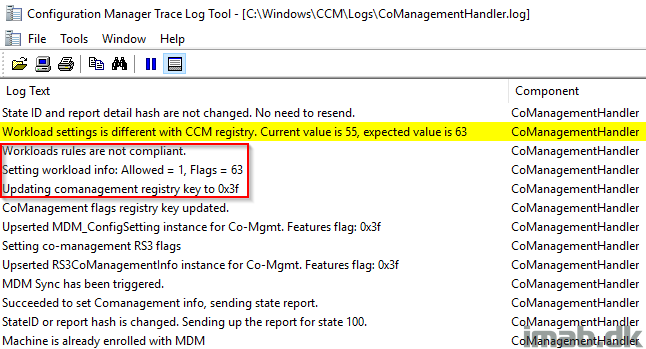 This is the latest addition to the co-management world introduced in Configuration Manager 1806 (released 2 days ago at time of writing) and it’s absolutely amazing. Before being able to do anything in this regard, we have to move the new workload into Intune. This is done in the Configuration Manager console, in the Administration work space in Cloud Services -> Co-management. See below illustration. Note: I also need to mention, that in order for this to work on the Co-managed device, the SCCM client of course needs to be running a 1806 version. 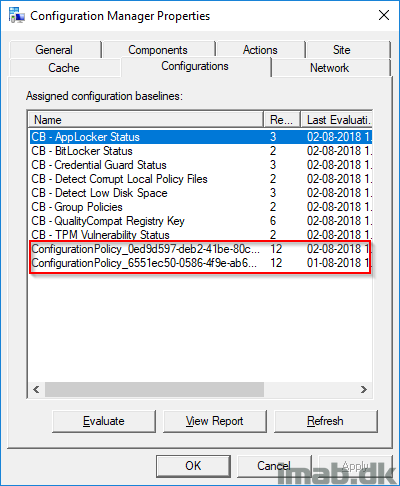 Once above changes has been done, the Configuration Policy will be updated with a new revision and as of such, the clients needs to have their machine policies refreshed (everything standard SCCM behavior). Once refreshed, you can monitor the addition of the new workload in ComanagementHandler.log on the client. In below snippet, my workload capabilities are moving from 55 to 63, which is indicating the switch of the new workload has been picked up. Now, moving over to Microsoft Intune, we are now able to create custom Device Configuration profiles and assign those to the Co-managed devices. A perfect first choice here is to have a look at the CSP policy called MDMWinsOverGPO. 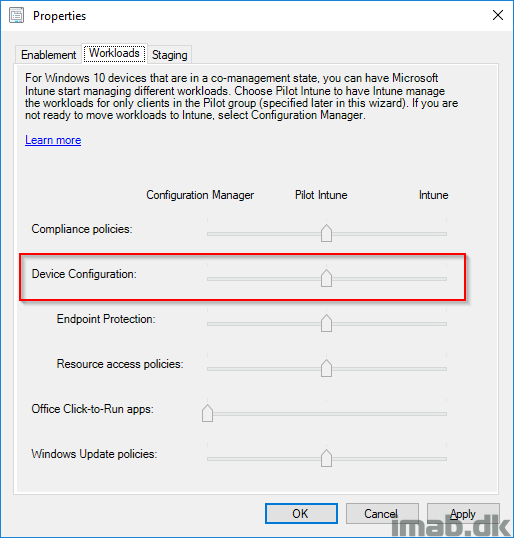 Create a new custom Device Configuration in Microsoft Intune and assign in to your Co-managed computers. Today, and POST SCCM 1806 we see this. Yay! 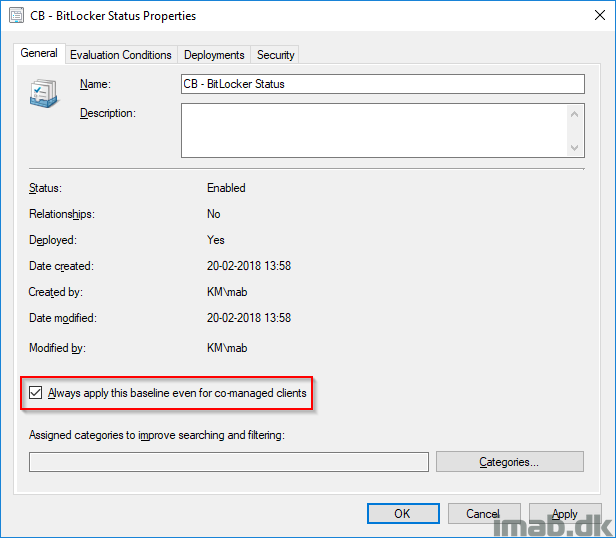 If you switch the Device Configuration workload into Intune MDM, and still want your baselines to be applied onto your computers, remember to enable this. Oh, and by the way. Now you can visually see the Co-management configuration policies in the Configuration Manager applet in the Control Panel. Nice! Great post – appreciate this. Would you elaborate any further on your Intune policy naming convention? I have SCCM 1806 environment. Even in Intune the policies assigned shows a status not applicable. Actually the client was not upgraded properly. After upgrading it is working fine.